Why do we get the feeling that Chris Brown isn’t genuine with the idea of starting his own children charity. 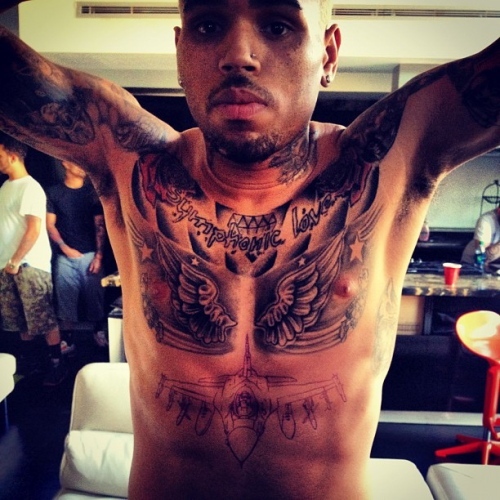 The singer, who beat up Rihanna (we had to mention it), wants to start a charity that will help kids to be more creative and share their work with the world, seeing that Chris has a huge passion for artwork himself (see his shirtless body for a perfectly good example – it’s covered in “art”). The charity will also focus on educating teens due to young adults struggling to find jobs, and not to forget, it will also help raise awareness about domestic violence. Brown has definitely been trying to show people that he is trying to turn his life around by starting a charity of his own where teens and younger children can be creative and share their work along with focusing on domestic violence and educating students. Let’s just hope no children get hurt when he loses his temper! Ha. We had to insert a joke here.